My worst case scenario, and how you can avoid it. When my mom told me that she scheduled the removal of my wisdom teeth for over winter break, my initial concern was missing out on a few days of holiday fun. Little did I know, the ordeal would last over a month, include multiple trips to the doctor (and the ER), and span across two states. Now that it's all over, I feel much more confident and in charge of my own health, and I learned a thing or two about staying calm in a difficult situation. Good lessons aside, there's a lot that I wish I knew going into the process. 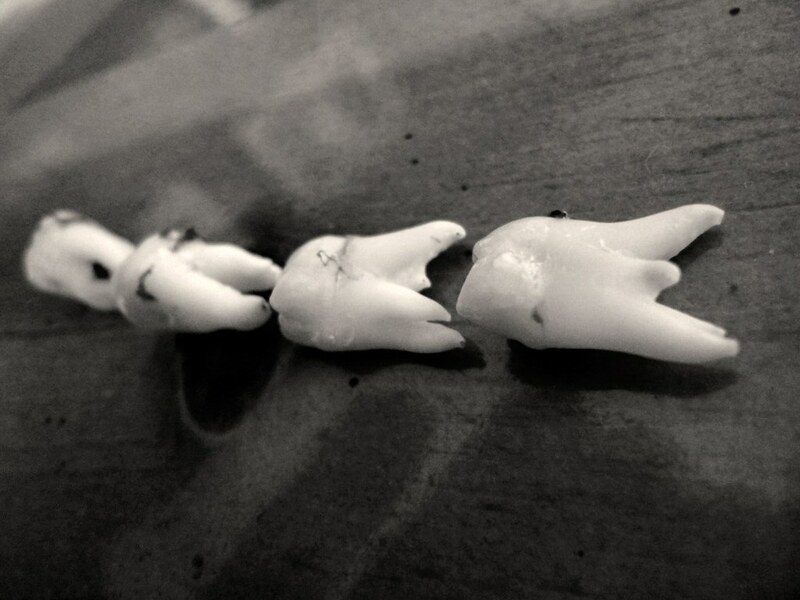 Here's the story of my wisdom teeth fiasco, so that you're better prepared than I was to face the surgery that started a series of unfortunate events. On December 28th, I reported to my oral surgeon, and with a quick 20-minute procedure, all four of my impacted wisdom teeth were completely removed. I woke up from the anesthesia feeling surprisingly good, and despite my swollen cheeks, gauze-packed mouth and drugged-up haze, I successfully requested a chocolate milkshake from my mom. A few days went by, and I was sure I was on the road to recovery. I stopped taking my prescription pain medication, and the swelling in my face had started to go down. But of course, it was all too good to be true. #SpoonTip: You don't want to ignore any pain you're feeling post-surgery. It's better to be overcautious and check in with your doctor along the way if you feel anything out of the norm. About 5 days post-op, I began feeling a throbbing pain in my lower jaw that extended up to my ear, almost like an earache. I debated trying to just tough it out, but I made the right call and asked my surgeon what was going on. It turns out that I had a condition called dry socket, which happens when the protective blood clot that normally forms after a tooth is removed fails to develop. My doctor informed me that only 2-5% of all tooth extractions suffer from this complication–lucky me! Thankfully, my doctor applied a medicated dressing to relieve the pain and allow the blood clot to reform. Things were starting to look up, and I left the doctor's office dreaming about solid foods again. #SpoonTip: Do your research on dry socket before getting your wisdom teeth out. It's rare, but it's super preventable if you know what to look out for (and trust me, you want to prevent it). A few days later, I felt completely back to normal. No pain, no swelling, and ready to head back to school for spring semester a bit early for sorority recruitment. Unfortunately, my experience was not over. On the second day of rush, I woke up with a fever and a very swollen cheek. I immediately knew something was wrong, but I had no idea what to do. My doctor was back in Chicago, and I couldn't get in touch with anyone over the weekend. It was time to be an adult, and I could not have felt less prepared. #SpoonTip: Getting a fever after surgery is a huge red flag, so make sure to call a medical professional ASAP if this happens. After a few hours of panicking and googling St. Louis oral surgeons, I was able to reach one who was on call. He told me that due to my fever, it would be best to go to the emergency room. Cue a whole lot of panic. My friends were busy with recruitment, my parents were a state away, and I had to get it together all on my own. Long story short, the emergency room doctor confirmed I had an infection. I was placed on antibiotics and sent on my way. I had to return to the oral surgeon to have the infection removed, and to finally put an end to the most stressful week of my college experience thus far. A few months after the trauma, I am relieved to announce that I'm in the clear. Though I now feel much more mature and comfortable making my own health care decisions, I wouldn't wish my struggles upon anyone else. Even though it's funny to watch videos of people drugged up post-surgery, make sure to take wisdom teeth removal seriously, so that your only experience with dry socket is reading this article. And my best advice: remember to reach out to your surgeon (or another one who's on call) if anything feels abnormal post-op.